We all know Armstrong’s story: winner of the Tour de France for a record seven times after surviving what was supposed to be a fatal diagnosis of stage 3 testicular cancer; and suspicion and later a confession by him that yes, he did dope on every tour that he had won. Based on the book Seven Deadly Sins: My pursuit of Lance Armstrong by Sunday Times Journalist David Walsh, The Program takes us through Lance’s career highs, and eventually, his very low lows. But for being a cycling film about competition, stamina, drugs, celebrity, and money, it’s not a very exciting film. Walsh is played by Chris O’Dowd, and The Program is his story told through his eyes and how he uncovered what is the biggest doping scandal in sports history. It’s about how he pursued and investigated Armstrong and was persistent in finding evidence that Armstrong was doping. The Program begins in France in 1993 where 21-year old Armstrong (played by a determined Ben Foster) is riding his first Tour de France. He’s young, cocky and confident, but two years later he’s diagnosed with cancer. Determined to come back better than ever, Armstrong pushes himself to the limit, and he fully recovers enough to go back to professional cycling. But he starts taking EPO (Erythropoietin), a drug that makes athletes go faster. It’s a drug that he procured from a French pharmacy and later from French doctor Michele Ferrari (Guillaume Canet). But Armstrong makes one mistake while he’s in the hospital for his cancer treatment; he tells the attending doctor about all the drugs he is taking or taken, including the EPO. His friends, fellow rider Frankie Andreu (Edward Hogg) and his wife Betsy (Elaine Cassidy) overhear this and Betsy questions Andreu who has told her that he as well has taken EPO. During this time a team doctor has been caught with performance enhancing drugs, which leads the police to raid the Tour only to discover that drug use is normal. Armstrong fully recovers and is asked to be part of the U.S. Postal Tour de France Team. Armstrong, and the rest of team, are blatantly doping. In ‘The Program’ we see deliveries to their trailer, needles put into shoes and, after injected, put into soda cans. Meanwhile, Walsh is hot on the tails of Armstrong. He tries to convince his editor that his instincts are correct, and says “Is it real or is it dope?” At the same time, Armstrong creates a cancer charity called Livestrong, where we see, in the film, him giving speeches to raise money for the charity. win. It’s 2009, and Armstrong wants to make a comeback, and Landis ask to be let back onto the team, but Armstrong says no because he got ‘caught’ which becomes the Lloyd’s catalyst for Landis to confess about the rest of team’s (and Armstrong’s) dope usage. Meanwhile, Armstrong takes third place, very bitter that the new star on his team, Alberto Contador, has beat him. And Finally, we see Armstrong, after all these years, and allegations, on the Oprah Winfrey show, where he tells her, and us, that yes, he’s been doping on every tour that he’s won. And hence his downfall, not just from racing, but from everything. Sponsors drop him right and left and his career, and perhaps his life, is left in tatters. The Program follows the meteoric rise and dramatic fall of one of the biggest celebrities in the world of sport, but somehow director Frears misses his mark. Frears, who brought us the fantastic Philomena and The Queen, — both movies about two determined, strong and powerful women — doesn’t know how to grasp the story of a man who is conflicted by his quest for winning versus his choice to dope. His Armstrong is a bit of a cartoon character, a man who seems more possessed and less determined. And the women in his life are non-existent. There is Armstrong’s 2008 marriage to Anna Hansen in the film, but there’s no introduction to his first wife Kristine (with whom he had three children), nor his 2003 relationship with singer Sheryl Crow, nor his 2007 relationship with designer Tory Burch. Foster is fine as Armstrong, if a bit too passionate and overwhelmed, while O’Dowd is his usual self, dramatic and comedic when needed. But screenwriter John Hodge appears to have taken Walsh’s timeline of what’s in the book line by line without creating any dramatic license to make the film a bit more lively. And while there is exciting footage of bike races (and actual footage from the Tour de France), it’s not enough to make The Program worth a view as it does not present us with anything new about Armstrong. The Program is now out in theaters. 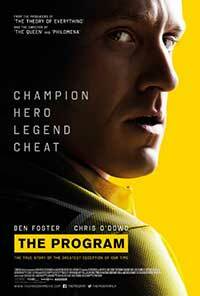 The Program gives us Lance Armstrong's up and many downs told in a story that mostly goes downhill.